Recently I had some tough projects, how the heck did I get through them - I am still not sure. We all do it, we face challenges that require change and somehow we dig deeper and get through, it is a life necessity. This we can easily relate to project management environments in our work-worlds. We roll out a project and hand it over to operations. The project was unique, so had some uncertainty (so there is no project that goes 100% according to plan). There also is a small percentage of stakeholders that will "buck" the new project solution, and just are not ready or willing to change. So how do we get through this transition. One method is to break it down and focus on all key stakeholders, one person at a time. You should also ask for help from others since likely you can't do it all. But key is to formally plan it, develop a matrix, identify each person and then the decisions and actions needed related to each person, then assign an owner to that task. (this is also where that very detailed Stakeholders Matrix comes in very handy). You likely don't have time to go to each individual, but what you could do is bring ones together as a group then help each one of them find it in themselves, embrace their inner confidence and face the transition both individually and as a team. Part of the energy I got to continue through my recent transition came from this article, which is a nice one to share. It is more on the individual/personal side vs the Project/technical side of things, but that is the beauty of project management - when you involve people, you must let aspects such as emotion and inner-self-awarness be part of your planning. 1. Turn the volume of the drama script down. 2. More emulation and less comparison. 3. Embrace your situation but don't identify with it. 4. Don't be afraid to ask for help. 5. Intend clearly to the universe what it is you need. 6. Don't torture yourself with things that have not happened yet. 7. Recognize when it's time to gestate, and when it's time to act. 9. Love yourself whatever happens. 10. Laugh at least once a day. 11. Move your body. Do sport, yoga, whatever fits you best. 12. Follow your body's intuition. 13. Eat food that nourishes you. Are we too polite to ask for sign off on certain things. Every PM should have a sign-off log. It is well within your accountability to ask for a sign off and enter that sign off into your Sign Off Log. It is human nature to forget what we have agreed to, especially if asked to approve something verbally and our mind is occupied on 5 other things at that moment, and in the heat of the moment we agree, but in the end, were rushed into it or did not put the focus and priority that we should have. Put some formality and structure and consistency around sign-offs. This will be better for both the person signing off and the person requesting the sign off. The type/means of sign off you ask for is dependent on the size/complexity and also the level of person (CEO vs Director). Different means of sign-off include: signed paper, signed electronically, response of approval in an email, verbal, etc. A more common approach used today (especially if requiring multiple sign-offs) and also now being accepted in court more and more is approval and acceptance via email. It mostly depends on how you word the email to them and then how they respond. E.g. when sending the email, at a minimum, clearly state "Please print your name and the words Approved and the date, in accordance to the Item you are approving". Then put a clear description of the item you are asking them for approval and acceptance.. Then also state to the effect "upon entering in the words "John Doe, Approved, Jan. 13, 2014, you are accepting and approving the item as described below and this will be formally entered into the Project Management Approvals log. The implications and next steps of this sign-off include: .......... <<<< then enter a statement or bullet points what this sign off means and what will be the result and next steps>>>>....."
How you word the email can be customzied for your company, the KEY thing though is to be consistent. Create a template of text for the email and have it followed by all people requesting a sign-off. A sign-off formalizes that the proper people were communicated to. Then they must also take it seriously and provide any feedback at the time. For items that require a high number of sign-offs, you should create your own log specific to that item (e.g. Change Requests, Issues, Risks, etc). We must continue to include dynamic PM approaches on our tool belt (Spiral vs Waterfall). Many organizations (directed right from the top) still follow a strict waterfall approach. This approach is easier to budget, schedule and assign ownership/accountability, however, it is not easier to provide a solution that the customer is happy with. We live in a world where the customer/end-user changes their mind throughout the project and new findings, influencers, technologies and products become available monthly. "In an ambitious plan to upgrade urban India, Prime Minister Narendra Modi says he will build 100 "smart cities"
"Cities in the past were built on riverbanks," "They are now built along highways. But in the future, they will be built based on availability of optical fiber networks and next-generation infrastructure. Jason comment - we need to be dynamic and adaptable with our project management approach, we need to focus more on our PM Culture, not our PM Tool set, since the Tool set will always be changing. We are managing for solutions that we dont even know for sure how they will be fully maximized. Be open to innovation and change within your approach. Take a smaller, more modular approach (If you have a huge project over a year long, then break it down, create programs of multiple projects, and have a formalized position called "Program Manager" (very different role then Project Manager). "New cities are popping up in countries like South Korea, the United Arab Emirates, and China, which announced an $8 billion investment fund in smart city technology this year." Projects generally have an immediate impact of loss..... in areas of productivity, value, time, money and and gains in ....... stress, anxiety, conflict and frustration. Ensure this is understood by all stakeholders. And know that you can fight this with good Change Management. You WILL pass through that negative dip and you will get to the other side, which is greener and will result in your true desired state. You must ensure to utilize your business/project plan as to WHY you took on the project. Based on the "why" you must have a clear definition of the value parameters. Then related to this value, you must create a change management plan that will minimize negative impacts, speed up the transition through them, then attain and maximize the positive impacts. 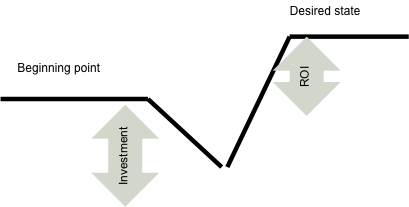 This approach also helps justify the investment vs the ROI. A Change Plan is key to help with the mentality of stakeholders, better understanding that there is a plan and it is only a temporary bad stage that has to be gone through. When people expect things (know it is coming) everyone is generally more positive and understanding and willing to push forward more collaboratively to get to the next stage of increased productivity. Change Management can be focused on in several areas, one of the key areas is of course "people". Have a plan for the people, and how you will manage them through the change. Always ensure a part of the project plan focuses on change management and how the new solution will integrate into the existing operational environment. Don't be afraid of a dip, that generally means you are changing something, and change is a must for growth and advancement. If the dip gets too large, then break it down into smaller ones, but don't let-up. It must be noted, sometimes people confuse Change Control with Change Management.Change Control is focused on changes in Scope (or sometimes called Scope Creep). This is by far the most dominating type of change projects have to deal with continuously throughout the project, thus people think it is the only real thing to focus on. HOWEVER, the true value of projects is the difference it makes after it is rolled out.